Wedding Ceremony at Gregynog Hall & Gardens01686 650030workWedding Ceremony VenueGregynog Hall is without doubt the most romantic of locations, laced with symbolism from the times of the Princes’ of Wales and cultural significance. Impress your guests with the exquisite good taste of the Davies Sisters, in a building where Renoirs, Monets and Picassos once hung and Rodins still stand. 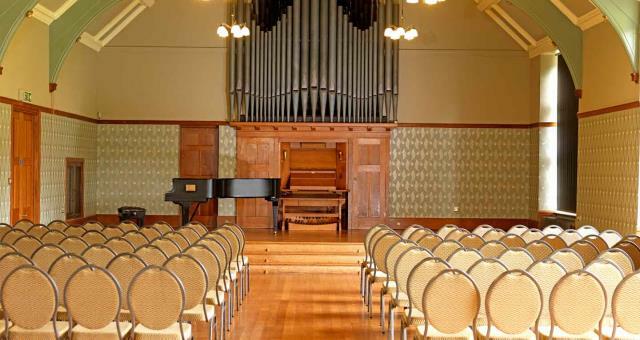 Four of the historic rooms at Gregynog Hall are licensed for civil ceremonies from the Music Room, which seats up to 200 people for a ceremony, to the Blayney Room, with its fantastic oak carvings from the 17th century. For smaller ceremonies the Library, with its Art Deco furniture and Senior Common Room, with grand piano and fine works of art make an ideal venue. Gregynog Hall Head Chef has designed a fantastic range of menu’s to suit the most discerning tastes, with a number of options for your wedding breakfast and evening reception. A variety of associated drinks packages, offering cocktails and champagne, are also available. Gregynog Hall is without doubt the most romantic of locations, laced with symbolism from the times of the Princes’ of Wales and cultural significance. Impress your guests with the exquisite good taste of the Davies Sisters, in a building where Renoirs, Monets and Picassos once hung and Rodins still stand. Gregynog has maintained its flexibility, added this to imagination and insight, to create individual weddings and personalised packages. You will find that the venue can provide precisely what you require, including grand marquees on the lawns to a tranquil afternoon of croquet. They even have two helicopter landing positions for those who want to fly in or out from local airports.